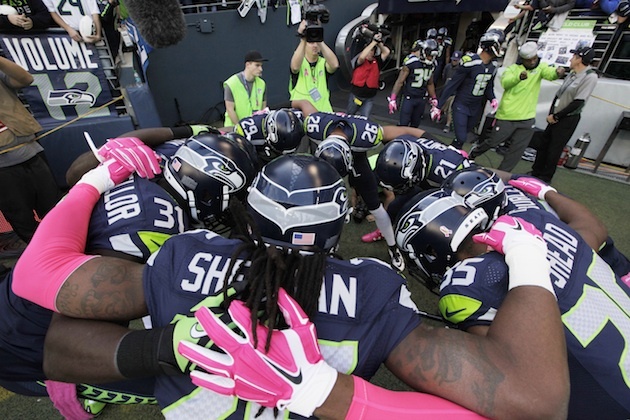 Can the Seahawks salvage their season and make the playoffs? Heading into Super Bowl XLIX, the Seattle Seahawks seemed on the verge of becoming one of the NFL's best dynasties. Now, not even a year, and five losses, later, has Seattle's dominance come to an end? Coming off their crushing Super Bowl loss via a last-second goal-line interception that denied them a repeat championship, the Seattle Seahawks faced a clear question heading into the 2015 season: Would they be able to put that brutal defeat to the Patriots in the rear-view mirror and remain among the league’s elite? Plenty of teams have successfully bounced back after a big loss, but few have had to overcome that magnitude of disappointment and anguish on the league’s grandest stage. A seven-day off-season trip to Hawaii for informal workouts and team-bonding activities was to designed to let the Seahawks air their grievances and confront the tensions that had lingered into the spring. The gathering, it was hoped, would relieve the pressures that had engulfed them the previous season, while they worked to establish themselves as a team that would finish games and fight together come September. Six games into the season, and the Seahawks still seem to be suffering from a Super Bowl hangover. At 2-4, Seattle finds itself in the NFC West basement along with the San Francisco 49ers — a pair of teams that look like shells of themselves on both sides of the ball. Following yet another stunning fourth-quarter collapse on Sunday against the Panthers, the season is quickly spiraling out of control. Worse, the Seahawks are staring down a potential playoff-less campaign for the first time since 2011. It’s dire deja vu for Seattle fans, who’ve watched their beloved ‘Hawks blow fourth-quarter leads in each of their four losses. These late-game breakdowns are made even more alarming in light of one of Pete Carroll’s most crucial coaching tenets: the importance of finishing. Right now, however, no team in the league is doing a worse job of closing out games than the Seahawks. Their four fourth-quarter blown leads are not only the most in the league this season; they’re the most any team has suffered in its first six games since the 1999 Saints. Making matters worse, Seattle is being outscored 55–27 in the fourth quarter, the second-worst differential in the NFL. The recurring meltdowns reached epic proportions in Week 5 when the Seahawks blew a 17-point advantage in the final frame against the Bengals. It was the largest blown lead in the Pete Carroll era, and the first time in franchise history that the team had lost a game they’d led by at least 17 with one quarter left. Following that heart-breaking loss, Carroll tried everything to fix his squad’s late-game woes. He held a special team meeting to focus on finding ways to finish games better. He preached optimism. He even brought in the Kenyan Boys Choir for a sing-along at the conclusion of last Wednesday’s practice. Alas, none of that did anything to change the course of the season, as Seattle saw its 23-14 fourth-quarter lead against Carolina evaporate in the final minutes Sunday afternoon, resulting in yet another crushing defeat. The Seahawks’ late-game defensive collapses have been particularly appalling for a team so defined by its historically great defense. In fact, Seattle entered the 2015 slate having finished three straight seasons leading the league in points allowed, the first team to do that since the 1969–71 Vikings. Before the season started, some had put them in the conversation with Pittsburgh’s Steel Curtain, the mid-1980s Bears and the aforementioned Purple People Eaters as one of the best defensive dynasties in the modern era. Now, that legacy seems more a distant footnote, with the Seahawks’ vaunted D struggling mightily to get stops late in games. Only three teams have allowed more fourth-quarter points than the Seahawks (55), and only one has given up more yards per play in the final frame. Richard Sherman and Co. have let their opponents get a first down or touchdown on a whopping 37.1% of plays in the fourth quarter, the highest rate among all teams. The crux of Seattle’s struggles, though, is that the once-feared Legion of Boom that has played more like the Legion of Bust in recent weeks. 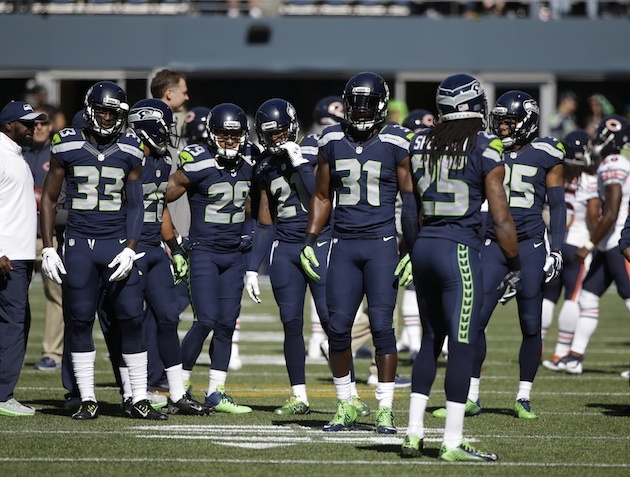 The Seahawks D no longer intimidates, as opponent after opponent has managed to pick apart the Seattle secondary at will down the stretch. The fourth-quarter numbers against Seattle are staggering. One example: Quarterbacks are completing 84% of their passes, at a clip of 10.2 yards per attempt, with four touchdowns and no interceptions. On Sunday, Cam Newton was 12-of-15 for 162 yards in the final 15 minutes, leading the Panthers on consecutive touchdown drives of 80 yards to seal the win. For the Seahawks, the defining image of that contest — and the season writ large — was Richard Sherman and Earl Thomas staring at each other in disbelief after Greg Olsen’s game-winning touchdown. As it turns out, the pair of All-Pros were in two different coverage schemes on the play — Sherman was in Cover-2 and Thomas in Cover-3 — leaving Olsen wide open for the decisive score. Their inability to cover Olsen highlighted a particularly troubling trend for the Seahawks' defense, which has been torched by tight ends the entire season. They entered Week 6 with the third-worst pass defense versus tight ends (per Football Outsiders’ metrics), and did nothing to improve that ranking against Carolina, as Olsen finished with seven catches for 131 yards. The Seahawks defense isn’t the only culprit in these late-game collapses, however. The offense is averaging only five yards per play in the fourth quarter, and has registered just one offensive touchdown in the final frame. Among teams that have played six games this season, only the Jaguars have scored fewer fourth-quarter points than Seattle's 27. In their collapse against the Bengals, the Seahawks punted on six straight possessions to end the game, the offense completely folding during the final minutes of regulation and overtime. 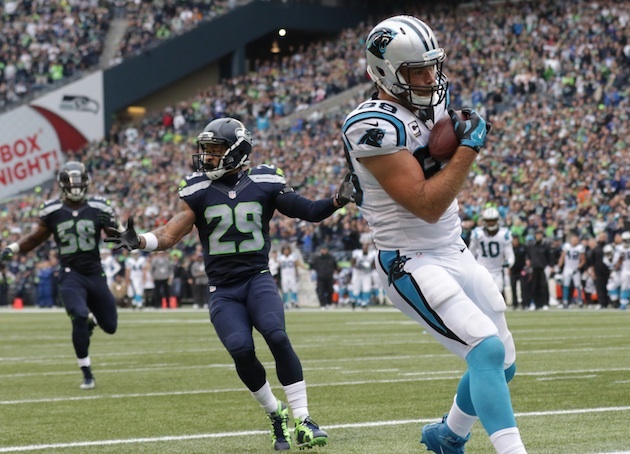 Although the defense remains a serious concern, there were some positive takeaways from the Panthers game that Seattle can build on from an offensive perspective: They finally figured out how to get Jimmy Graham involved in the passing game. The result was the freak-of-nature tight end’s best day in a Seahawks uniform (eight catches on 12 targets for 140 yards). Marshawn Lynch, meanwhile, returned to the lineup to run for 54 yards and a touchdown, and looked his spry, punishing self. You never want to label a game in October as a “must-win,” but it’s hard to discount that Seattle now faces long odds just to reach the playoffs, let alone defend their two straight NFC titles. Since the playoffs expanded in 1990, just 14 teams have started 2–4 or worse and reached the postseason. That number dwindles to a mere four clubs who’ve cracked the playoffs after starting 2–5, putting more pressure on the Seahawks to stop their skid this week. Seattle has never overcome this poor of a start to make the playoffs, and the only teams to pull off the trick in the last 10 seasons were the 2008 Dolphins and 2011 Broncos. What’s more, none of the above-mentioned 14 teams ever reached the Super Bowl, and only two even made the conference championship game (the 1996 Jaguars and 2002 Titans). Still, projections remain more bullish for the Seahawks, whose favorable remaining slate helps. FiveThirtyEight.com gives Seattle a 42% chance to make the playoffs, placing them right at the 12-team postseason cutline, just a hair ahead of the Vikings (40%). The Seahawks have faced the second-toughest schedule of any team so far (per opponents’ win percentage) and should have ample opportunities to make up ground in the NFC playoff race. Five of Seattle’s final 10 games are against divisional opponents, and they have only four games left against teams currently above .500. In fact, per FiveThirtyEight.com, the Seahawks are favored to win in nine of their 10 remaining games, with the lone exception being their Week 17 road tilt against the Cardinals. Thursday night’s showdown with San Francisco provides an ideal setting — on paper, at least — for the Seahawks to turn their season around. They’ve won five of their past six meetings with the 49ers, most of them in dominant fashion. They’ve also won 10 of their last 11 regular-season primetime games, and are a league-best 14–2 under the lights since 2010. The Seahawks insist the sky isn’t falling in the Emerald City, that there’s still ample time to battle back and earn a playoff berth. They know they could easily be unbeaten. They boast one of the most talented rosters in the league, and it would be foolish to completely dismiss them. However, despite the reasons for continued optimism, the Seahawks’ four losses are as real and ink-set as it gets. Until the defense figures out how to stop teams in crunch time and the offense shows it can consistently execute in late-game situations, it is very possible the two-time defending NFC champions will be sitting out the postseason party in January.